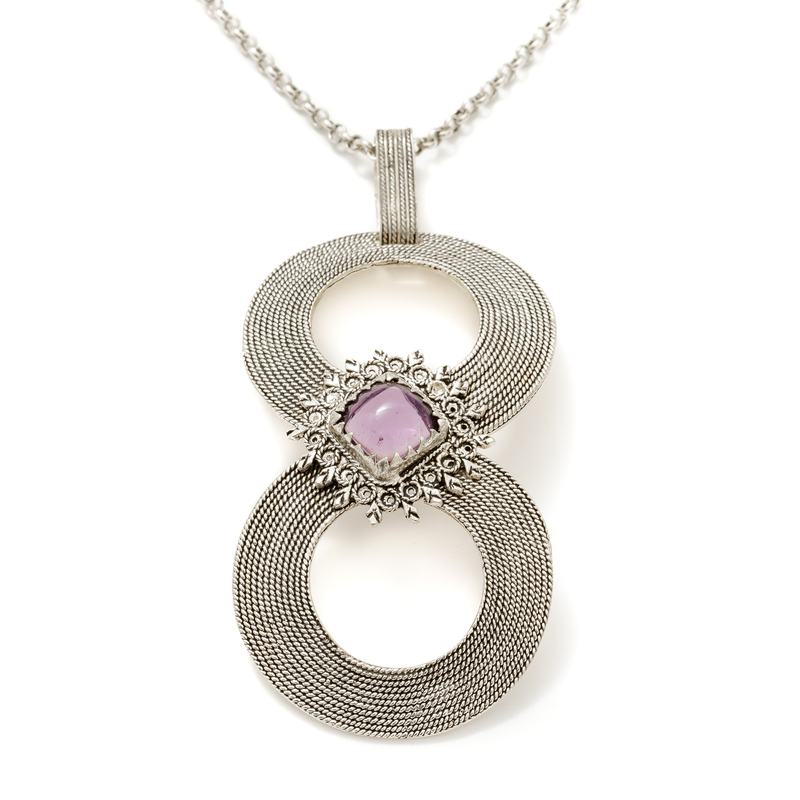 This originally designed silver pendant with prized amethyst-purple vitreous paste symbolises infinity. Handcrafted, it can be customised in colour of stone. 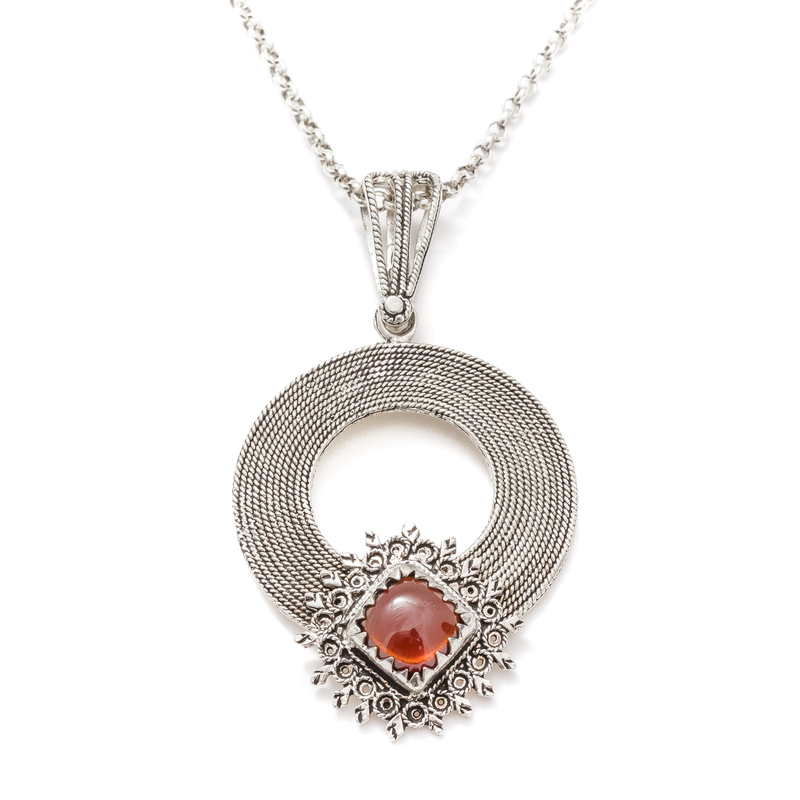 The simple circular shape of this silver pendant is embellished with a sophisticated decorative bezel in garnet-coloured vitreous paste. Handcrafted, it can be customised in colour of stone. 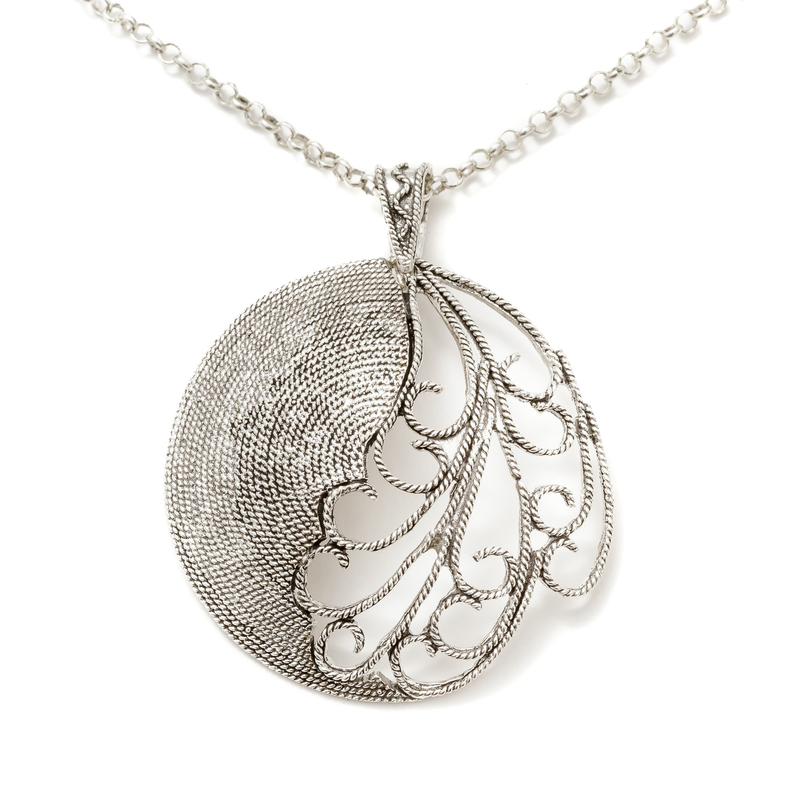 The round form of this fine silver pendant combines the ornaments of the local goldsmith tradition with wavy shapes that are inspired by seaweed. It is part of the Duos line featuring the combination of traditional motifs with original interpretations. 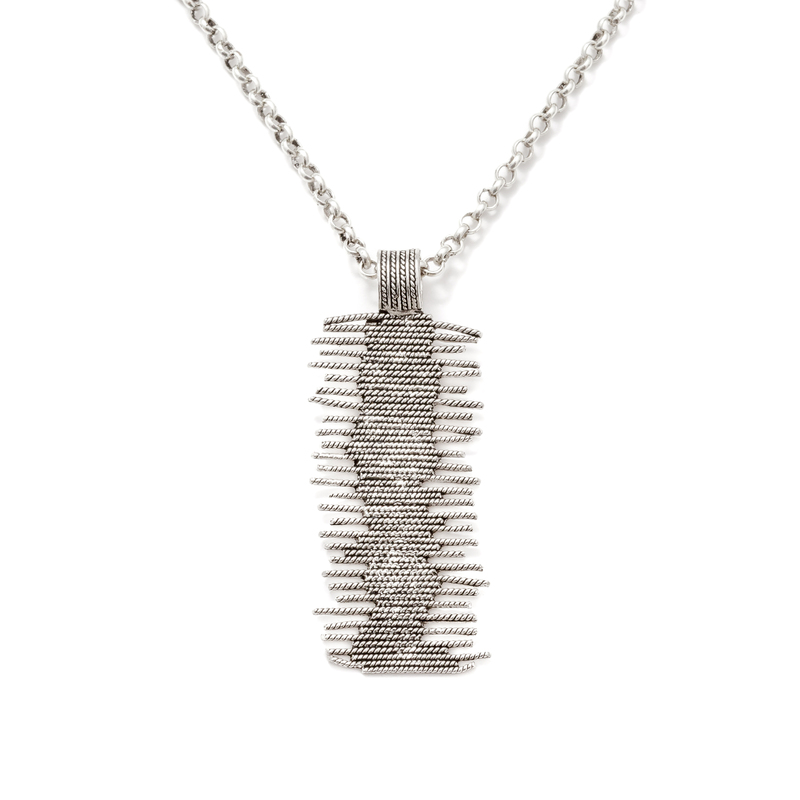 This original silver pendant recalls with its parallel lines the concept of weaving, interpreted with an eloquently synthetic graphic trait. Handcrafted, it can be worn with a matching ring and earrings. 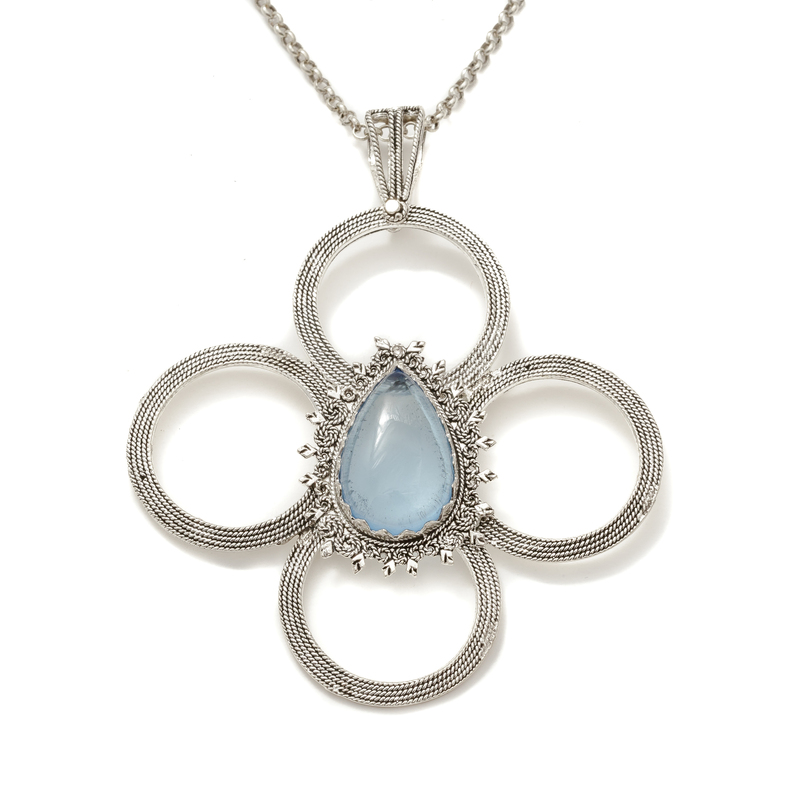 This elegant pendant in the shape of a flower with four petals is embellished with a decorative drop-shaped central bezel in light blue vitreous paste. Handcrafted according to an original design, it can be customised in decorative details and colour of stone. Paolo Zirano’s goldsmith production is characterised by the revival of themes and echoes of tradition, aesthetically reinterpreted in a manner that adds free inspiration to local goldsmith techniques. Paolo was only twenty when he learned the techniques of the craft working as an apprentice at a goldsmith’s workshop in Sassari, where he specialised in lost-wax casting, which he uses to craft his line of fine silver jewellery. His distinctive feature is the juxtaposition of filigree (decorations) and stylistic reinterpretations that revisit the forms inspired by themes of nature, rituality and symbolism of traditional craft. His workshop, Il Giglio, in the centre of Sassari is where he crafts, with the invaluable support of his wife Mariella, a wide range of jewellery often featuring the combination of silver with coral, hard stones and vitreous paste. Paolo Zirano’s jewellery production counts several lines of jewellery in silver and stones characterised by a strong echo of the local tradition, yet revisited with new taste and personal technique. The Duos, Noba and Presciada collections are just a few examples of the lines and inspirations proposed by the workshop Il Giglio. Paolo Zirano’s jewels are crafted with the micro fusion technique, associated with embedding for the numerous stones and vitreous paste used.